In the twelfth month take thirty jin of the meat of a particularly tender wether. Within the thirty [jin?] should be ten jin of fat. Put it in a wok and boil the meat, and make it extremely soft. Strain out the bones, split and break down the meat fibers , and retain the broth. When you are steaming the rice for the wine, evenly scatter the fatty meat on the surface of the mixed rice, and steam it until it is soft. Mix it in a common bowl, use a full six dou of the meat broth, to completely spread the savory flavor throughout. Steam it again, a good long time to get rid of what’s on the table top, and spread it to cool. 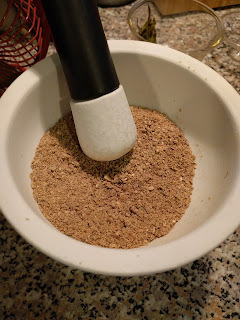 Select some good dregs, and mix it in according to the previous recipe. 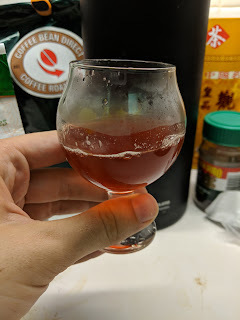 Again take two sheng of meat broth, and put it together with what’s already on the table and the first liquid to be pressed out. Pass a few days following the usual method for big wines, but only use yeast starters from the middle of the cakes [?]. One method is to distribute the dregs, and only put the boiled meat into the additions of grain. Take dregs at one time and mix them into the weng. The wine canon was published in 1117 during the Song dynasty, and according to the dictionary 王力古漢語字典, during the Song dynasty one dou was ten sheng, and one sheng was 670 mL. One jin was 633 grams. That makes the overall recipe call for 18.99 kg of meat and 4.154 L of broth. I'm not making this because I don't eat sheep. But maybe someone will. Science and Civilisation goes on to point out that this wasn't just this one book. Mutton wine continues on after North Hill, with books in 1235, 1330, sometime in the Yuan dynasty, and 1596 all having recipes.